I have been toying around with making my own baby food for years. I'm not totally committed to it, because homemade baby food doesn't really store and travel well. Since we try to give baby nothing but the purest ingredients, it's always been a choice between convenience and quality. Beech-Nut, one of the brands of food I've fed all of my kids, has launched a new way of feeding baby that takes the water, thickener, and preservatives found in most jarred baby foods, and leaves only the food. In addition to being packaged in cute jars that I'm already excited to reuse for buttons, paperclips, and the like, we are super impressed with the contents of those adorable jars. The stage 1 foods (for babies 4 months and older) are single-ingredient foods like apples and peas. 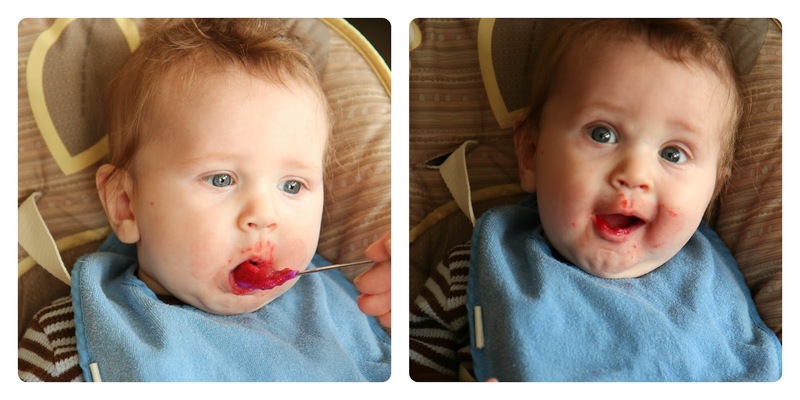 The stage 2 foods (for babies 6 months and older) get creative with combined items like beets, pomegranates, and pears. Why does this excite me so much? As a mom who wants her kids to develop tastes for new flavors, it's important that they get introduced to new and exciting foods at an early age, but I also don't want to sacrifice "homemade". This new line gives me the chance to introduce baby to things like aronia berries, avocado, and asparagus -- even when they aren't in season or available in my area of the country. 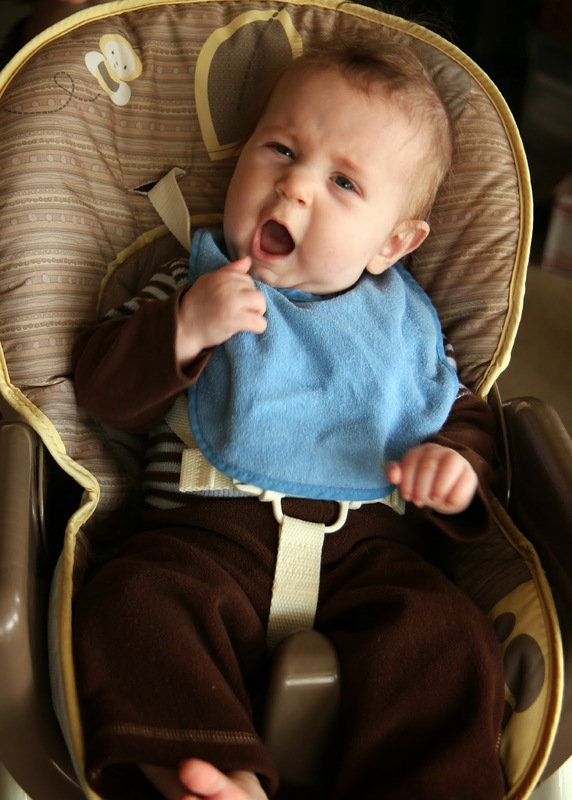 Our little guy is just now getting into baby food, so when we put him in his high chair and make him sport the bib, he gets cranky. He can't wait for his food. From the photos below, it's obvious that he really digs this product (it is FOOD, of course). The veggies gave him just as much pleasure as the fruits, which was exciting to see. In this video, he is chowing down on the Beets, Pomegranates, and Pears (stage 2). I added just a tiny bit of cereal to it to help thicken it; if you find that the "just" products are too watery -- as homemade often is -- you can thicken it on your on, as well.